Medium sized evergreen of bushy and spreading habit. 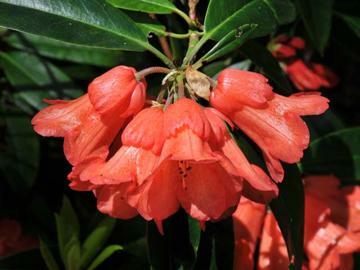 Attractive loose trusses of drooping bell-shaped soft orange flowers with a touch of pink. Usually late May flowering. Best in partial shade, well drained, moist acid soil. Needs a sheltered position and is not suited to very cold locations.